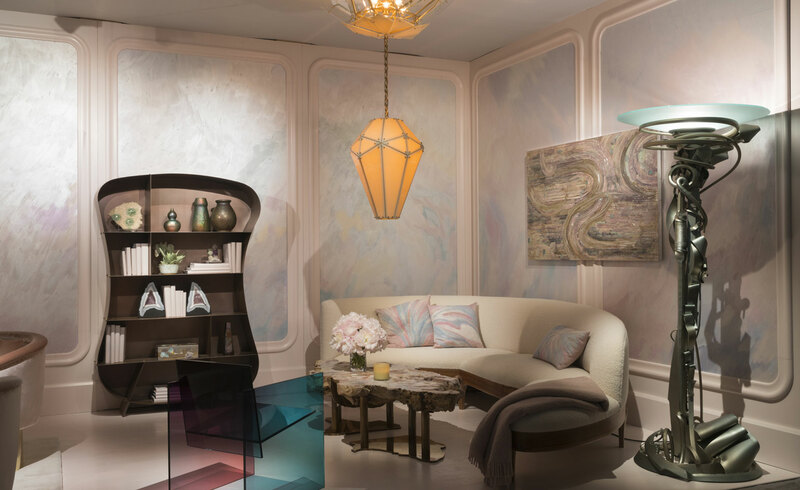 Interior design took a role for the first time at this year’s edition of The Salon Art + Design NYC with the invitation of the interior designer Amy Lau to make part of the designshow. Marking her debut, New Yorker Amy Lau created a living-room environment titled ‘The New Nouveau’. Filled with limited edition showpieces from the past and present – including a sculptural pink iron cabinet by Xavier Lust, hand-painted metallic wall panels by Calico Wallpaper and a specially commissioned light piece from Mary Wallis for Lindsey Adelman Studio– the sumptuous setting was a sight to behold. This installation is conceived as a unified whole, featuring the natural forms and curved structures inspired by an array of international designers embracing a vast range of mediums – ceramics, glass, metal, minerals, textiles, and wood. At the heart of the atmosphere by Amy Lau installation is Michael Coffey’s sculptural walnut fireplace facing, paired with a bespoke bronze and porcelain fireplace screen by David Wiseman. Calico Wallpaper’s custom hand painted mural wall panels inspired by metallic luster glazes and decorative moulding details surround the space in a custom rose quartz color. Iconic furnishings from the Art Nouveau period to contemporary design heirlooms by Germans Ermics, Mark Brazier-Jones, Mary Wallis, and Xavier Lust are highlighted. All upholstered items are covered exclusively by Dedar fabrics, accessories such as ceramics, glass objects, and mineral specimens are also displayed, including an historic, immense 307 carat Burle Marx Brazilian Crystal Opal and 18 karat gold necklace.